Only 4 more days left until Halloween, so I have another Halloween recipe to post. I saw these cute little Halloween Ghost Peep S'mores posted on Pinterest a couple months back. As soon as I saw them that I had to make them for my kids. I was thinking these would make a cute addition to the Halloween Treats that I'm putting together for my children's close friends in the neighborhood. Since we will be out trick or treating we will not be giving out candy, so I want to make sure to have a few fun treat bags for our close neighbor kids before we head out. I also plan on baking two different types of cookies and adding some candy as well. 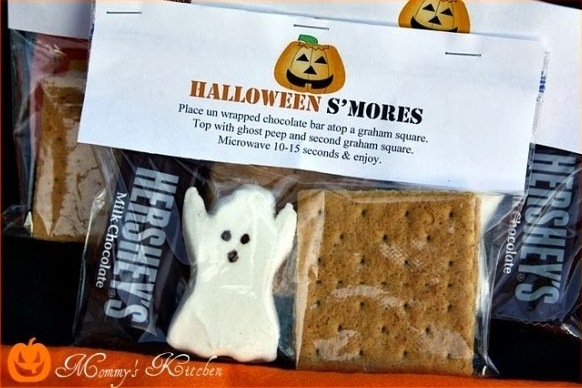 I think everyone will love these spooky little s'more treat bags. This is a cute idea for family parties, close friends, girl scouts or cub scout parties. These s'mores literally cost me next to nothing to make. The box of graham crackers were under $2, ghost peeps were .98 a package, and the small Hershey bars were $1 for a package of 8. All in all it cost me under $4 to make enough for 8 kiddos. I got the idea for the bag tags from Southern Plate. I just adapted them into a Halloween theme. I have included a link for a printable version of the Halloween Smore Tags. You will need two tags per package. One for the front and one for the back. Walmart sells the neat little clear cellophane party bags which are perfect for the s'mores. If you are unable to find them you can use a zip lock sandwich bags instead. Just fold over the zip part so it was under the tag. Staple the tags together and you're done. If you don't want to mess with the tags you can always just tie some Halloween ribbon around the gift sacks punch a hole in the tag and run the ribbon through. Of course we had to try a few out to make sure they were edible LOL. We did find out one thing...... S'mores always taste better when bunny ears are involved. Add one Halloween peep, two graham cracker squares and one Hershey bar package to each gift sack. Attach s'mores tag with directions and staple shut. To assemble and eat the s'mores: Place a marshmallow peep on a graham cracker. Microwave on medium or use the reheat setting for 5 - 10 seconds. Top with chocolate and another graham cracker. Cool and enjoy. Be careful as the softened peep will be hot. The link is only for Halloween S'mores and not Ghost S'mores since readers are having trouble finding the actual Ghost Peeps. If I label them as Halloween S'mores then everyone can use the tags whether they find the pumpkin or ghost peeps. These are so cute! I might have to get these done this weekend! They are really easy to make and all the kiddos will love them. We've done 'smeeps' before around Easter time and my kids have tried and tried to make the peeps explode. Never happens, but it sure is fun to microwave them. I think it would be even more fun to watch the ghosts - haven't seen them anywhere though. I found both the ghost and the pumpkin peeps at Target. Walgreens usually has them as well. Oh my word! This is an absolutely adorable idea! You have the best! Please be sure to check out my post today - I shared several pix and links to your delightful Halloween ideas. Thanks a million for sharing. I made these to give out as treats to my third graders. They turned out so cute. The kids loved them! Thanks for the idea. 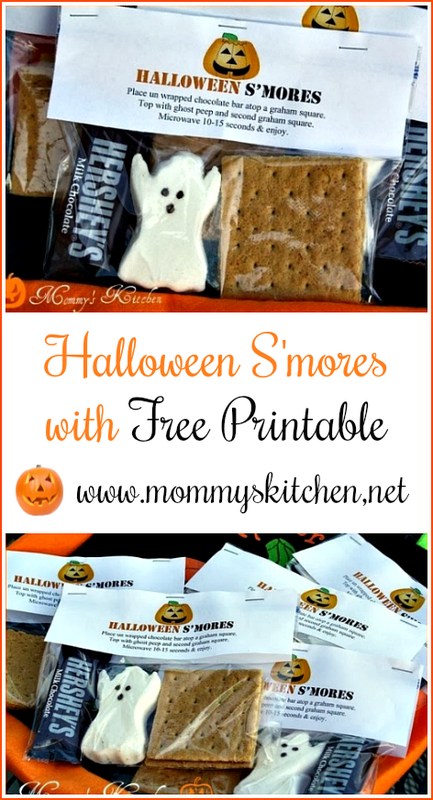 Where is the link to print the "Halloween S'Mores" tag? 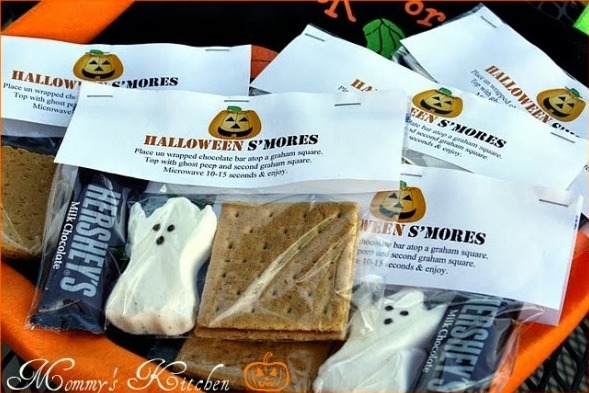 You need to click on the link that says "Halloween Smore Gift Tags. Once you click on the link it will take you to the tags to print. I will add the link here as well. Thank you Tina. I found the link to print....worked perfect! Cute! Cute! Cute! I will be giving these out to my Brownie Troop for their Hallowwen treat at our monthly meeting. These are the cutest find! I am making them for my daughter's birthday party and may even make them for my class for Halloween! Thank you so much for this GREAT idea! Made these today as thank you gifts for the rehab staff where my husband was cared for after his heart attack. Tag: There is s'more I want to say, but I'll leave it at "Thank boo!" Used six different Halloween clip art pix, made a long tag, orange ribbon. 10 seconds was enough time in our microwave. Thank BOO for a great idea. These are fantastic! I am going to make a bunch of these and let my son take them to his classroom Halloween party. What fun a clever treat idea! Thanks for sharing. I looked everywhere for the ghost peeps and finally found them at Michaels. I can't wait to make these treats for my son's classmates. Just made these last night and I could only find the pumpkin peeps but just as cute! I'm using these as prizes for a BINGO game with the kids at our party. THANK YOU for the GREAT IDEA!! These are adorable! What a cute idea for the kids I know! (The rest can dive into a bag of Costco candy! LOL We get 300+ kids on Halloween, it's an expensive night.) I'm headed shopping tomorrow, I may have to grab some of these ghosties. Thanks for sharing! Your Halloween Ghost Peep S'mores are so adorable! I just love them! Pinning! Thanks for the great share! Thank you for posting this wonderful idea. Never did find the ghost peeps (waited too long), but Kraft puts out small marshmellow ghosts that did the job in a pinch. This idea got 4 thumbs up from my grandchildren. Am handing them out for Halloween and stamping our name and address on the back so parents don't throw them out. Thank you again...just love them. These look awesome! Can you tell me what to set the microwave at to heat them? I don't want anything blowing up or melting all over! Thanks so much! You are a complete GENIUS! This is the cutest idea ever. My teen daughter's friends have been begging for desserts coming to school with my daughter for them (I too have a food blog). These are the perfect, unexpected treat to send to school. My project for tonight. I shared a link to your post on my FB page too. I'm so making the goody bags. If you go to the Peep website, click on Store Locator and it tells you exactly where you can buy the ghost peeps in your area. Worked like a charm ;) thanks for this idea! All local stores were out of the peeps as of Oct 18th. I bought the last ghosts at Walgreens. Next year, I plan to buy all supplies early for better selection. BTW, my packages all turned out great! I received lots of compliments on the few I made this year. Putting these together for my daughters preschool class' Halloween party! Thank you for the adorable idea. Tina: These are such cute ideas but I cannot get the link for the ghost peeps - just the ones for the pumpkins and the ones with the witch. Can you please help? I am wondering if others are having the same problem ! Thanks. There isn't a tag for the Ghost Peeps. I originally had the tags as Ghost Peep Smores. but people were emailing stating they could not find the ghost peep S'mores and only the pumpkin ones, so I changed the tags to Halloween S'mores so everyone could use them. These are so cute, so easy, and the kids loved them. I did these for a 2nd grade Halloween party and doing them again this year. Last year we used ghost peeps, this year pumpkins. I've also seen headstone peeps in five below. Also very cute!